The RY Kalay Pandaw, entered service last month in Mandalay, and the RV Kindat Pandaw, launching next week in Rangoon, both draw not more than 75cm or 2.5 feet making them the shallowest draft passenger vessels in Burma. These are ships that can go where no other ships can go. As the river silts up making going north of Mandalay more difficult. Other operators build larger and larger ships, Pandaw is going smaller and smaller. The loveliest of rivers. In the past this was only offered during the monsoon due to water levels. The river carves its way through mountains and forests and stops are at delightful unspoilt little towns. The tiny Kalay will ply the Upper Chindwin weekly between Monywa and Homalin. Monywa is under three hours from Mandalay and the car transfer is included with the cruise. Homalin is now connected by scheduled flight with Rangoon, Inle and Mandalay. Kalay with only five cabins, one of which is the luxurious ‘Owner’s Cabin’, sails every Saturday. The Kindat will sail weekly between Mandalay and Bhamo, the most northerly navigable point on the Irrawaddy, 1000 miles from Rangoon and close to the China border. Highlights will be passage through the 3rd and 2nd defiles, not to mention visits to enchanting local towns, most favourite being Katha, once home to George Orwell and the setting for Burmese Days. Bhamo is now a big trading town with a strong Chinese influence. We will then continue in the Kindat, if water conditions permit, or by local boat to enter the awesome 1st defile with its cataracts and towering gorges. There are now direct flights to and from Bhamo to Mandalay, Inle and Rangoon. Kindat with only twenty cabins sails every Sunday. Pandaw has scheduled these sailings around the airline time tables so it will be possible to book these two expeditions back to back making a fourteen night adventure with one night in Mandalay in between. 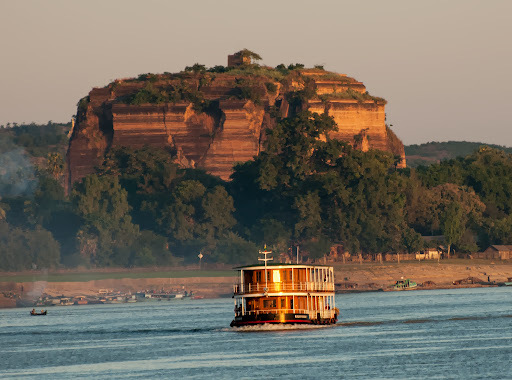 Guests would fly Rangoon Homalin, sail down to Monywa, then transfer for one free night in Mandalay and the next day joining the upstream cruise to Bhamo and fly back from Bhamo to Inle or Rangoon.